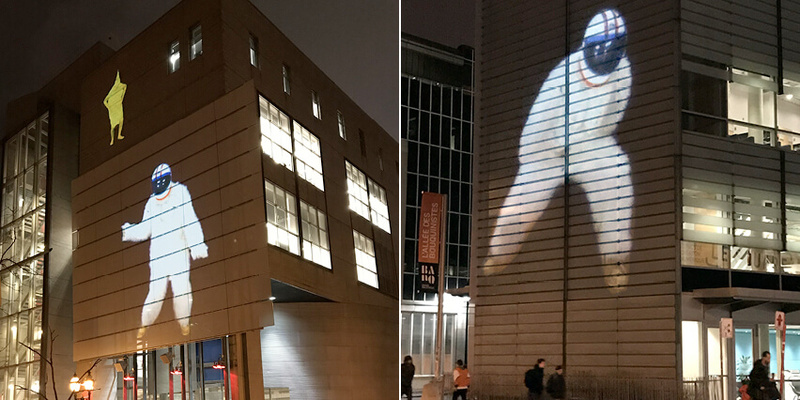 Just in time for springtime, Montreal’s Quartier des Spectacles is pleased to welcome Space Monkey, a new architectural projection by New York’s Dawn Of Man creative studio. From April 5 until May 31, get ready to meet the galaxy’s friendliest simian across the Quartier! This astronaut monkey will add a touch of absurd humour in the Quartier. Space Monkey and his friend Banana Man are sure to grab people’s attention with their hilarious festive dances, in phase with the festive energy from springtime. Space Monkey is presented by the Partenariat du Quartier des Spectacles and is a part of the MUTEK_IMG program. 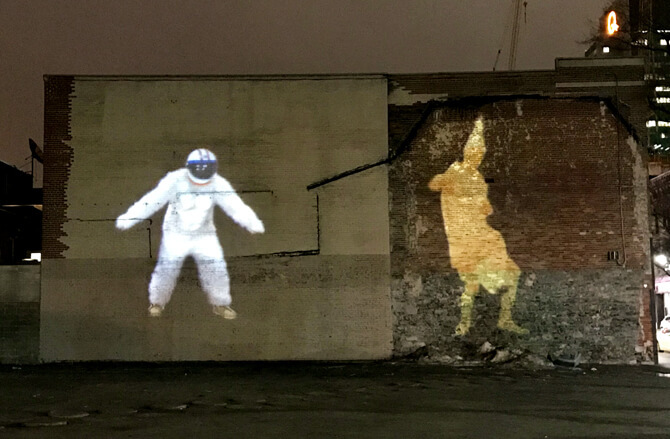 The projection was previously presented at the Adelaide (Australia) Festival of Arts, North by Northeast in Toronto and Detroit’s Dlectricity. Alongside Space Monkey’s arrival in Montreal, and as part of the official Digital Spring program, MUTEK_IMG – the forum on current practices in digital art – will host a panel on digital art experimentation for public space, The discussion, presented in collaboration with Mapp_MTL and the Partenariat du Quartier des Spectacles, will take place on April 12 from 1 to 3 p.m. at the Phi Centre. Leading artists and curators from Montreal and elsewhere will present their work and discuss the creative, aesthetic, technological, political and social challenges of architectural projection and other uses of digital imagery in the city. Max Nova, a co-founder of the Dawn Of Man collective and professor of Live Video Performance Art at New York University (NYU) will be one of the panellists. The event is free and open to all, but reservations are required via MUTEK_IMG. More information about the Space Monkey exhibition is available via the Quartier des Spectacles.